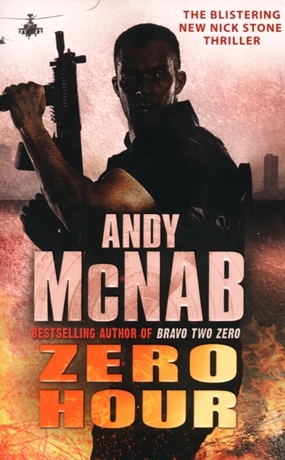 A new Nick Stone adventure thriller has just hit the Bookazine shelves, written by “Andy McNab”, purportedly the most decorated SAS UK soldier, having won several medals during his time with them. He has written 12 “Nick Stone” novels, and this is one of the newer ones. It is interesting to conjecture that “Nick Stone” is the literary version of the author, but it should be taken into account that “Andy McNab” is also an alias! However, the hero was an abandoned child, as was McNab. There is an old adage which goes ‘write about what you know’ and these Nick Stone novels are prime examples. Zero Hour (ISBN 978-0-552-16259-3, Corgi Books, 2011) is concerned with human trafficking from Eastern Europe, and sees the hero Nick Stone becoming heavily involved in a hunt for a young woman who they thought had been trafficked, whose family was important, and at the request of the British government. Do not form the impression that this is a James Bond style of novel complete with exploding pens and dinner plates that fold up to become helicopters. 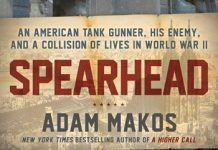 Nick Stone is an earthy hero, who gets beaten up several times in the 500 pages. He does do his fair share of beating others too, but he is a really human hero who bleeds, especially when he has just been stabbed with a knife. He also is given the news that he has an inoperable brain tumor, and with six months to live, decides he would make this his last sortie. One literary procedure to give weight and veracity to a work of fiction, is to introduce ‘real’ items amongst the imagined. McNab even mentions Viktor Bout, the arms dealer who was ‘detained’ in Thailand for many months and insinuates him amongst the international underworld from the old Russian federation. Another item was the North Korean nuclear reactor, complete with detail of its construction and the number of fuel rods it used. Nick Stone takes you through the Baltic States, Amsterdam and London as he pursues the human traffickers, and then in turn, finds himself being pursued. He describes in minute detail the agony of being stabbed and kicked, and you believe him, even though not many of the readers will have been stabbed and kicked. This is a fairly violent book. A few weeks ago I reviewed a book which had 25 “thriller” short stories and I commented on the fact that the “thriller” genre does not sit well in a short story format. This is really shown in this book, where the author takes the reader through an adventure, building up the suspense, and in this book leading to what is almost a double denouement. The build-up is gradual, then the pace quickens, and you are eagerly looking forward to the next page. Thriller to the core. I keep my contention that thrillers cannot be short stories. At B. 360 for over 500 pages, this is a cheap read for a long weekend. You will enjoy it. Your heart will quicken at times, and you will be surprised. You have my word on this.